Lord Cornwallis having failed to defeat the Marquis de Lafayette in the campaign in Virginia, was marching from Williamsburg to position his army at a secure port, Yorktown. Lafayette was aggressively following, avoiding a general engagement, but expecting to attack the isolated British rear guard, after the bulk of the British army had been ferried at the Jamestown ferry to the South bank of the James river. He sent an advance guard under Wayne to attack in the afternoon after 3:00, accompanying him, and leaving the bulk of his Virginia militia forces at the Green Spring Plantation under von Steuben. The advanced guard consisted of the rifles corps of Call and Willis and a squadron of dragoons, followed by the Pennsylvania line under Wayne. But Cornwallis laid a trap, concealing the bulk of his forces in the woods, while showing a small Jäger skirmish line astride the road. General Wayne with 800 men was unknowingly facing the entire British Army of 5,000 men under General Cornwallis. The American riflemen pushed forward, supported by the battalions of Major Galvin, and Major Willis, of Connecticut, and Col. Stewart's Regt. and two other Pennsylvania Battalions. The Jagers retired, while the concealed British sprang on each flank, Lieutenant Colonel Yorke on the left, and Lieutenant Colonel Dundas on the right, with Dundas were the Forty-third, Seventy-sixth, and the Eightieth Regiments. The American militia on the left retreated, while the Pennsylvania line on the right retired stubbornly. Wayne now perceived the dangerous trap. Wayne, recognizing that he would be overwhelmed before the rest of the American army could arrive, organized a bayonet charge. The British recoiled, and the British advance was temporarily halted, allowing Wayne to disengage and retreat from contact with the enemy. Lafayette hearing the sound of battle had drawn up some troops 1/2 mile behind Wayne, in support. The British did not pursue the retreating Americans, and resumed their loading on transports to Portsmouth, and then later to Yorktown. In the battle, the British had about 70 rank and 5 officer casualties. The Americans had 28 killed, with a total of 140 killed, wounded and captured, and two 6 pounders lost. The Americans escaped a 'near run thing', and Cornwallis covered his embarkation on the James river. The British failed to eliminate resistance in Virginia, while collecting large amounts of supplies. Cornwallis proceeded complacently to Yorktown. 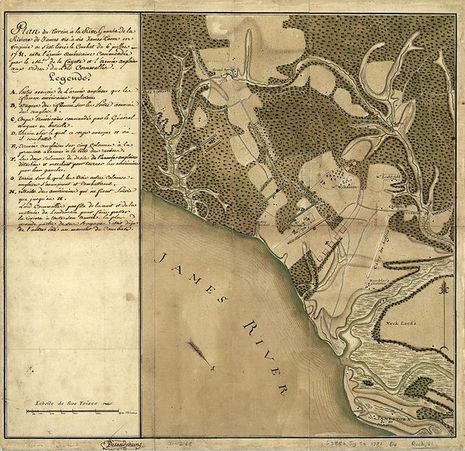 The Battle of Green Spring took place at Green Spring Plantation in James City County. Green Spring was a colonial era plantation developed by Royal Governor Sir William Berkeley in Virginia near the northwest tip of Jamestown Island, southwest of Williamsburg. On July 6, Gen. "Mad" Anthony Wayne was repulsed at Green Springs Farm by the British army in the last major battle of the Virginia campaign prior to the siege of Yorktown. Wayne, with a force of 800 men, was unknowingly facing the entire British Army of 5,000 men under Gen. Charles Cornwallis at Green Spring. Wayne tried to confuse the British by sending marksmen forward and by sending runners back 5 miles to the Continental Army to let them know what he was facing. Cornwallis, not fooled by Wayne's ruse, began to advance. Wayne recognized that he would be overwhelmed before the American army could arrived. He then organized a bayonet charge. The British, believing that no one would order such an attack without superior forces, withdrew to Portsmouth, and then later to Battle of Yorktown. 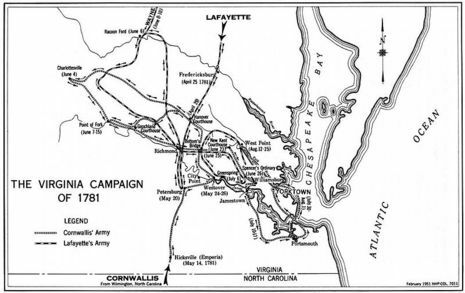 The Virginia campaign of 1781 was one of disappointment for Gen. Charles Cornwallis. His advance into Virginia, in May, left British forces in the Carolinas weak and on the defensive. And his efforts to subdue Virginia by engaging the continental forces under Lafayette proved fruitless. While British activities in Virginia did disrupt that state's war effort, Cornwallis had failed to score a decisive victory. And now, as July approached, orders from Gen. Henry Clinton to send 6 regiments to New York and establish a naval base with his remaining force made the likelihood of achieving such a victory even more remote. Abandoning Williamsburg in early July, Cornwallis made preparations to cross the James River just north of Jamestown Island. His destination was Portsmouth, but before he sent his army across the river, he tried one last time to draw the young Marquis into a major engagement. Concealing the bulk of his force along the shore, Cornwallis hoped to convince Lafayette that only a rearguard remained north of the James. To strengthen the ruse, two "deserters" were sent to the American lines reporting that most of the British army had indeed already crossed the river. Lafayette, seizing his own opportunity to deliver a decisive stroke, sent Gen. Anthony Wayne forward with a force of dragoons, riflemen, and light infantry. Numbering around five hundred, they skirmished all afternoon with the British, slowly but steadily forcing them back to the river. Around 5:00 P.M., the rest of the American army arrived at Green Spring, now about a mile from the fighting. Lafayette, growing more and more suspicious and cautious, sent only a portion of these reinforcements to join Wayne. He then rode to the river where a tongue of land enabled him to see the true strength of the British force. Although he had discovered the trap, Lafayette was unable to withdraw his forces before the trap was sprung. For as he hurriedly rode back to break off the engagement, Wayne's troops advanced towards the trap's trigger, an abandoned British cannon. At that point, according to Lafayette, the "whole British army came out and advanced to the thin wood occupied by General Wayne." The sudden appearance of the bulk of the British army, numbering close to 3,000 men, stunned Wayne's command. Wayne had just over 1,100 men to meet the attack. The British line overlapped both flanks of the Americans and to make matters worse, Wayne's left flank, manned primarily by riflemen, quickly dissolved. Wayne's reaction to the crisis was unconventional. Outnumbered by a nearly 3-to-1 margin, he ordered his small force to advance upon the enemy. According to Tarleton, "the conflict in this quarter was severe and well contested. The artillery and infantry or each army, in the presence of their respective generals, were for some time warmly engaged not fifty yards asunder." Wayne's men, against heavy numbers, made a brave fight. However, "the right of the enemy's line, having nothing but the retreating riflemen and advance parties before it, threatened to envelop the Americans; and with the pressure on their front increasing, they abandoned the field and retreated rapidly...to Green Spring." With darkness falling upon the field, and in spite of Tarleton's urgings, Cornwallis declined to pursue the fleeing Americans. Instead, he resumed his movement to Portsmouth. Though the Battle of Green Spring was ended up as a British defeat, Lafayette and Wayne, not to mention their men, lost nothing in reputation. They had extracted themselves from a clever trap and although suffering significant losses, had conducted an orderly retreat. Tarleton saw it differently though. To him Green Spring was a missed opportunity. If Cornwallis had pursued, "the army of the Marquis de la Fayette must have been annihilated." And that, contends Tarleton, "would have prevented the combination which produced the fall of Yorktown and Gloucester."